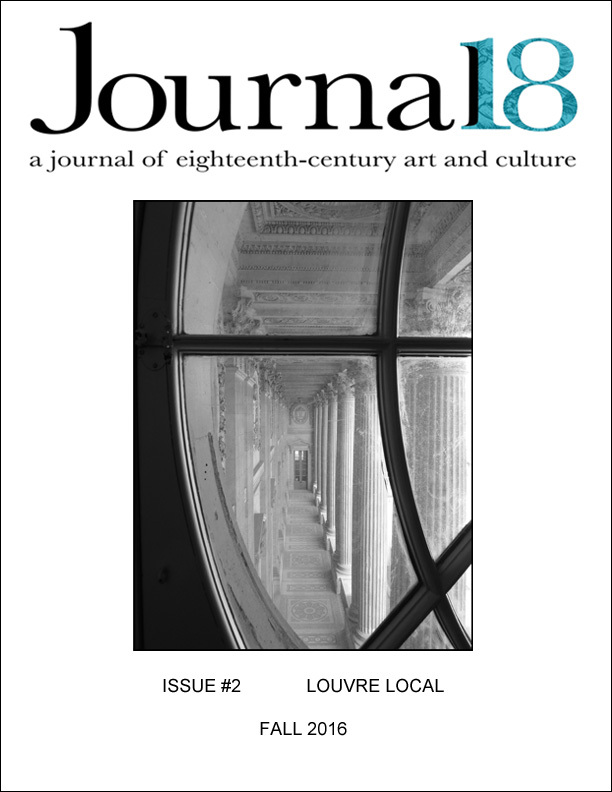 In issue 2, Journal18 delves into the fascinating but little known period of the Louvre’s eighteenth-century history. Now one of the world’s best-known museums, the Louvre was once a vast artistic center of a different kind. Even before Louis XIV moved the French Court from the Louvre to Versailles in 1682, the Louvre had already become a focus of creative, cultural, and intellectual energy in Paris, as artists and artisans of all trades—from watch-makers to history painters—were given lodgings and studio space in the same wings and corridors that accommodated cultural institutions like the royal academies. As the Louvre expanded over the eighteenth century, the palace and its surrounding streets came to be dominated by this growing community of artists, artisans, men of letters, and their aristocratic patrons, inhabiting this space and living out their daily lives together. Exploring this Louvre “neighborhood,” issue 2 asks: who lived in the palace? Who belonged and who didn’t? What activities took place in this domestic, professional and royal setting? What collaborations and interactions transpired in its rooms and corridors? How were spaces used? What objects resided here? And how was the building itself made and re-made, discussed and debated, recorded and narrated? At a moment when art history has become more and more global, this issue takes an intentionally local look, encouraging a more intimate approach to social histories of eighteenth-century art. Investigating the Louvre’s role in the art world of early modern Paris, the authors of “Louvre Local” make geographically and anthropogically inflected explorations in pursuit of a deeper understanding of life in the palace and the new art-historical narratives that such insights bring. Contributions to this issue include full-length articles as well as shorter “vignettes,” which metaphorically open a window through which to glimpse a snapshot of life in the Louvre. The issue also features a review of the recent landmark publication, L’Histoire du Louvre. Cover image: View through a window of the Colonnade of the Louvre. Photo: © Hannah Williams.